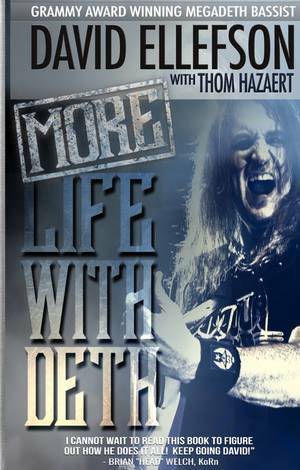 Megadeth bassist David Ellefson will publish "More Life With Deth", the follow-up to his 2013 memoir "My Life With Deth", in November via Ellefson Music Press. Ellefson co-wrote the book with his business partner, radio personality and music journalist Thom Hazaert, and features contributions from Alice Cooper, Brian "Head" Welch (Korn), Dirk Verbeuren (Megadeth) and many more of David's friends. "More Life With Deth" continues where Ellefson left off with "My Life With Deth." It picks up the story after his departure from Megadeth in the mid-2000s through his triumphant return in 2010, giving fans an inside look at the continued saga of one of the world's biggest and most enduring heavy metal bands. Through the words of Ellefson, Hazaert and friends and colleagues, including Malcolm Dome, Mark Slaughter , Marc Rizzo (Soulfly), Ron Keel and many more, "More Life With Deth" provides an insightful and personal look at one of the pioneers of thrash metal through his work as co-founder of Megadeth. "It's a good thing Ellefson found some time to write his new book, 'More Life With Deth', because I cannot wait to read it to figure out how he does it all!" says Welch. "Keep going, David!" Originally released on the independent label Combat Records, the project introduced leader Dave Mustaine’s thrash band following his 1983 firing from Metallica. The cover marked the debut of band mascot Vic Rattlehead and, while the record failed to chart in the US, the set went on to become one of the label’s best-selling releases and impressed enough to help secure a major-label deal with Capitol Records.